Japan holds a certain magic over me that I can’t quite explain. Maybe it’s the foreignness of the culture and their millenia-old traditions? Could it be the high-pitched, overtly friendly adverts that greet the breathing superorganism of Shibuya crossers? Maybe it’s the genuine curiosity of locals who ask you where you’re from and why you brought spare, empty luggage to Japan. In the summer of 2017, I shared a two-week trip to Japan with my friend Anna. Fast forward to the summer of 2018, I was living with my parents to save my money for my upcoming move to Los Angeles and I felt it was necessary to return to Japan with a more mature perspective. I learned that the comforting quiet that accompanied me during my solo travels is an overlooked luxury. It’s true what they say about solo travelers—they embrace the unknown and that becomes the norm for them. Allow me to share some moments from my Japan trip that stood out to me. I went about my first few days in Tokyo without much of a plan. One of the things I was excited to return to was the food. I made a reservation months in advance to have a seat at the world-famous Yasuda in Aoyama. Knowing very well what an omakase amounts to, I was hesitant at first but I wanted to challenge my presumptuous belief that a meal should meet a certain price-quality ratio to not be considered a waste of money. This particular dinner blew me away and I finally understood that certain culinary experiences transcend the act of consumption and can touch an individual on a spiritual level. I was the first person to arrive for my 6pm reservation. The hosts and hostesses kindly greeted me and checked that it was indeed I, Marco Martinez, who matched the name on the reservation. They sat me front and center where I was greeted by Mr. Yasuda. He was quiet at first, and I broke the silence by telling him how excited I was for this dinner. His laugh was warm, as I’m sure many folks have said before me. A video may suffice to showcase how unbelievably skilled he is, but I will attempt to recreate that scene through words. I think to use the word “dexterous” would be criminal. His entire body from torso, legs, to arms were synced up for the entirety of the dinner. 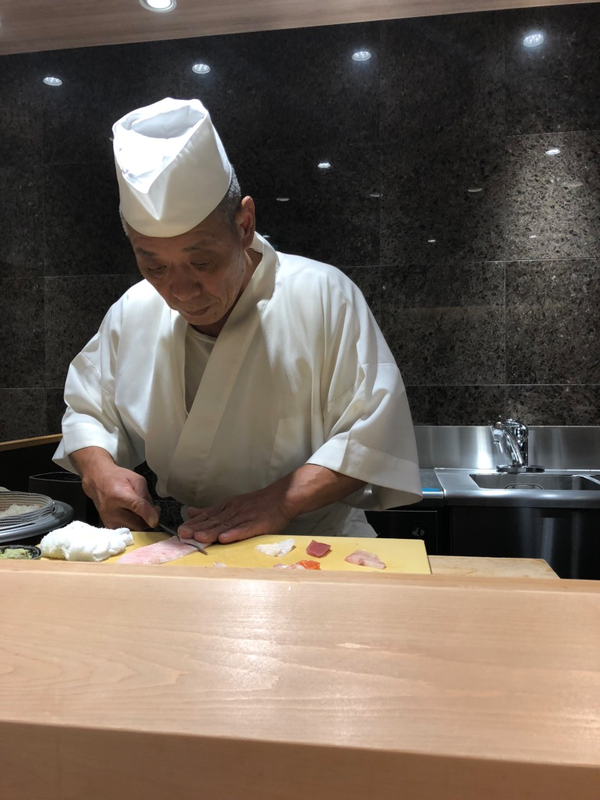 Whether he was slicing up the otoro (fatty tuna), molding the sushi, or talking us through the hundreds of possible tuna species that exist, his moves were precise and calculated. He was a master of his craft. Just as I aim to do in training and preparing for dance performances, Yasuda invites you into a new world, a multi-sensory delight that will leave its mark on you. I felt like a completely different person when I emerged from that basement. As I bid Mr. Yasuda adieu, I told him I would return some time in the future to try all of his otoro offerings. In Kyoto, two moments stood out to me: my arrival at the Arashiyama Bamboo Grove and my lunch at Wajoryomen Sugari. The one thing that overcome me at each of these locations was a feeling of contentedness in my anonymity. I was another passerby, an extra that happened to stroll into the background of someone else’s life. The groves were empty at 7:30am, save for a few tourists who did the right thing by setting up their cameras on the early side to beat the normal rush of late morning crowds. This day consisted of itinerary-less walking because I had a feeling that Kyoto’s offerings were less in tune with my tastes and interests. I wrapped up my day trip with a late lunch at Wajoryomen on the recommendation of one of my friends. It was nestled in a random alleyway with no obvious door markings, I followed some business man into a tiny opening that led into a waiting area that flanked an interior garden. Luckily for me, I was quickly seated as a solo eater. I helped myself to two bowls of their ramen and departed from the nondescript ramen spot completely satisfied. I returned to Tokyo with a few more spots to hit and one remaining item on my itinerary: Unknown Mortal Orchestra at WWW in Shibuya. This would be my third time seeing the band but my first concert in a different country and I highly recommend that you experience one during your travels! I shared the crowd with some of the most kind-hearted and polite folks who sung along to their mostly indiscernible lyrics. Though the crowd was fairly international, my neighbors held themselves to a high standard of concert etiquette that is often lost in the West. We were treated to my favorite set of theirs as they played songs from up and down their discography. My personal favorites are their early sing-a-longs: So Good at Being in Trouble and From the Sun which drew an emphatic reaction from the crowd. By the time the concert drew to a close, I only had 36 hours left in Tokyo. This exercise of reflecting on a trip months after the fact was like plucking little moments from a grainy highlight reel: so many amazing moments stood out to me that a single article could not do them justice. I can only encourage you to visit Japan and experience it for yourself! I arrived home with a full heart and an exhausted body and I packed my bags to move to Los Angeles. In the past four months, I started a new life surrounded by a community of other vintage clothing aficionados, and exploring a community on my other interests, like skating and fitness. Some days I feel lost in the monotony of making a living for myself, but I know deep inside that Japan is awaiting my return and I can’t wait to spend more time there.